I, Gloria Poole, residing in Missouri but born in state of Georgia, drew, painted, signed, photographed, and uploaded these 3 sketches and 1 oil painting to this mini exhibit of art blog of mine. Copyrighted. 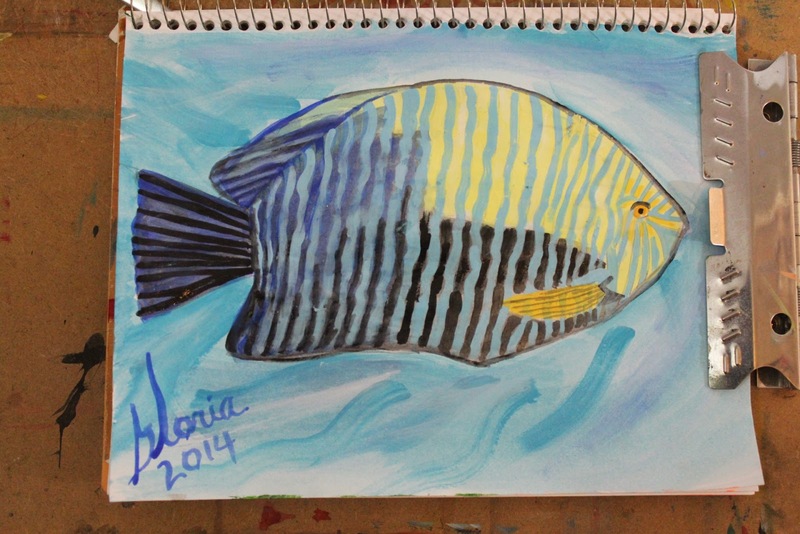 Angelfish of tropics, sketch by Gloria Poole of Missouri, 20 July 2014, acrylics on 8 x 11 paper in sketch book. 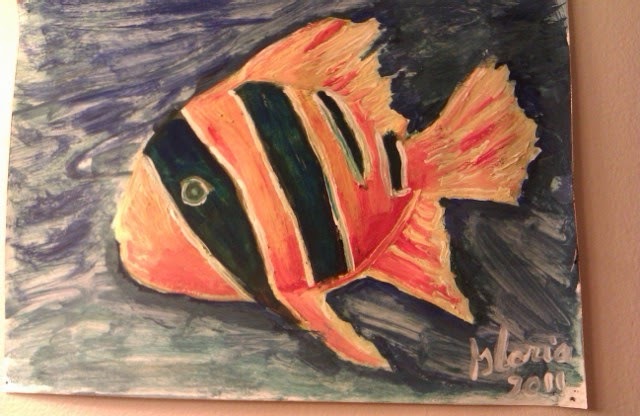 Tropical fish sketch by Gloria Poole of Missouri, yr 2011, acrylics on 8 x 11 paper. 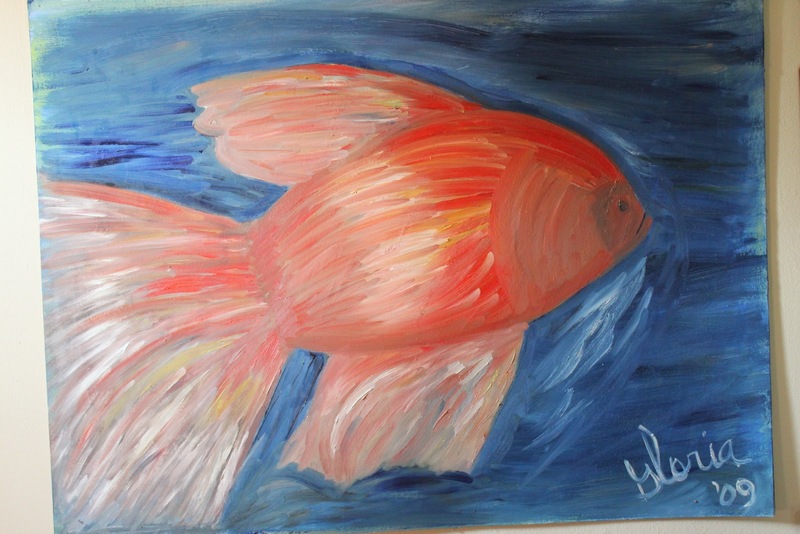 Giant goldfish oil painting by Gloria Poole of Missouri, but I painted this in zip code 80203 but I moved it with me to Missouri in Oct 2009, and have it on my wall. It is not lop-sided. But I tried about 10 times to re-photograph this today so it didn't look lop-sided but just couldn't seem to balance myself well enough to get photo straight. 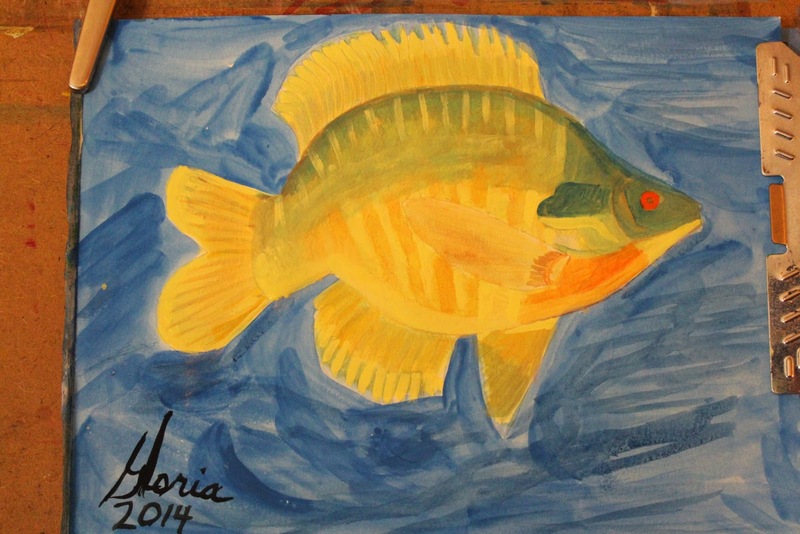 This is a large painting 30 inches tall and 40 inches wide and is on archival mat. My balance was affected by concussions I had secondary to trauma, and at times it's very bad. At other times, [maybe fatigue is the difference?] it's not so bad. I get very frustrated with it too, believe me! My camera can correct for much but not if I cannot tell in my brain when it looks correct. I think it is correct until I see the photo. I just got tired of trying to rephotograph it and decided to just add it. Copyright notice: this blog and all content of it belongs exclusively to me Gloria Poole of Missouri and I own all rights to it and to all content on it. I drew, painted, signed, photographed and uploaded ALL the art on this blog of mine [and on all blogs of mine] . I have the originals in tangible form. This blog and its individual posts may not be transferred to anyone anywhere, nor have domains forwarded to it that do not belong to me, nor be saved to disk it its entirety, nor copied, nor re-published, nor photo-copied, nor printed at remote, as this blog is intellectual property covered by U S copyright law. For the record: I am a white, Southern Baptist Christian woman and the natural mother of only two grown daughters who are Jennifer and Leigh, [but I have no sons]; and a Registered Nurse licensed in Missouri, an artist in all mediums, a poet, author, illustrator, writer, prolife activist, citizen journo, photographer [note: my genre photos tend to be better than trying to photograph something on a portable drawing board ; see some at https://gloriapoole.blogspot.com] ; and a republican, personhood amendment promoter. Gloria Poole / Gloria / gloriapoole / gloria-poole / gloria.poole / artist-gloriapoole / Ms Gloria Poole / Poole,Gloria / Gloria Poole, RN, artist / gloriapoole.RN / G-L-O-R-I-A / gloria_poole / @gloriapoole / Life.TV / mini exhibit of art / Gloria's blog / and other variations of my real, born with, legal name of Gloria Poole since I resumed my maiden name after both divorces including my born with surname of Poole, at my own, private apt in Missouri which is not shared with anyone and no one anywhere is authorized to log into any account of mine but me]; 20 July 2014 at 10:57am.